Yes, you can afford to buy a new helicopter, turns out ready built Mosquito XE’s start at $38,500 and lessons come in a package for $2,800 for ten hours of, and I’m promising this here, first rate instruction. Which as it turns out is all you need to fly one of these babies since they neatly fit into the ultralight category. You can even build it yourself from a kit for around $30,000. When you arrive at RotorF/X in Van Nuys, should you ever be so blessed, several wonderful things happen to you right away. First there’s the sweet sense of hospitality, then comes the aroma of fiberglass sanding dust, I think they should make a body powder so everyone could smell like that, and then there’s the Schweitzer, looking back at you, begging you to take lessons, with the enticing sparkle only a glossy craft sitting in the sunlight can offer. Jay is the big Kahuna, he introduced us to Chris our fearless instructor for the day. I had already enjoyed an hour and a half of constant helicopter ground school on the trip over from our technical director, Kevin Plunkett, a helicopter fanatic. But now the real truth comes out, will I really be able to do, let’s see. You really should know that I can not walk and chew bubble gum on the same day, much less at the same time, and I’ve heard more than my share of “helicopters are hard to fly” stories in the past few decades, but I have the courage of three or four people so I went anyway. Once in the air, and after just holding onto the controls lightly to get the feel for them it was my turn to fly or shut up. I take the Cyclic firmly in hand and make the hair’s breadth movements mysteriously designed in by helicopter engineers and sure enough we banked and turned with startling grace, arcing through the crystal blue skies over Van Nuys on a perfect Saturday morning. It seems now, with my new found knowledge, that any morning you are arcing through the skies with a cyclic in hand is a perfect morning. You can build time in one of these sweet machines for as low as $24 an hour. I learned a great deal about the wonders of RotorF/X and all they have to offer once I calmed down enough from the euphoria to concentrate again. Which took about two weeks, as it turned out. Here’s the rundown, brace yourself, it’s breathtaking. 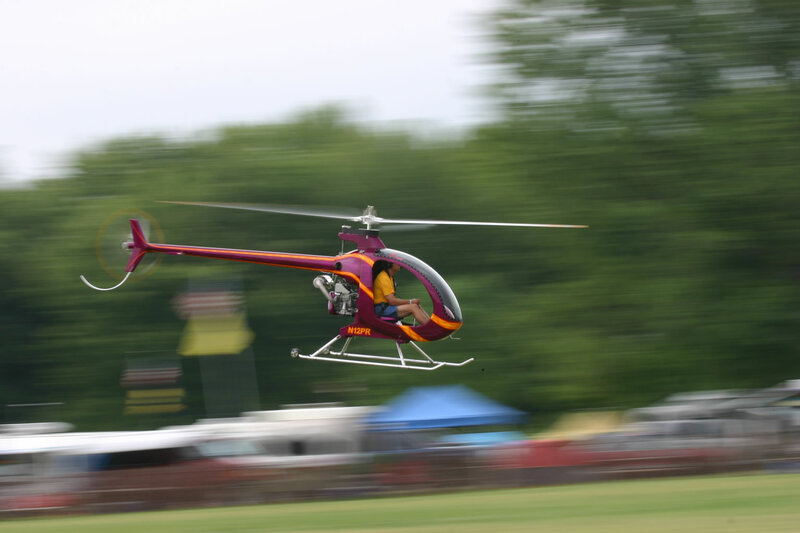 A Mosquito AIR or Mosquito XEL are both ultralight, meaning you do not need a rotorcraft license or even a skateboard license to fly them. Although, as with anything aviation related, instruction is strongly recommended because any distance higher than the tabletop is too far to fall, so best to know what you’re doing before you ascend. And speaking of going up, you might be thinking about power plants on ultralights, well you’re right, it is a two stroke. So Jay, wiped away most of our concerns by explaining that in the pioneering days of ultralights when boat motors and lawnmower engines were being bolted on willy-nilly by good intentioned folks who’d never thought through the need for mixture control and temperature changes the engine gained a very spotty record for itself. But over the years a great deal of research and engineering has come together to develop engines that are designed for the exact demands of flight, making it possible for starry eyed aeronauts to live the dream of the airborne afternoon. It is not a perfect system, but what is? Of the three experimental class models the one most likely to get the blood rushing is the Mosquito XET Turbine helicopter – the flagship model. The kit carries a skinny price tag of just over $40,000 and total operating costs of around $30 per hour. For a fixed wing pilot taking up helicopters you can either get the instruction you need to feel comfortable, RotorF/X recommends their 10 hour package, and fly with just your private pilot license, or you can get a recreational license or helicopter add on for just 15 hours dual and 15 hours solo, easy. You will amaze your friends, confuse your neighbors and be the first kid on your block to have one. According to RotorF/X the XET model is the most economical high performance jet helicopter available anywhere in the world. With the thought of extraordinarily inexpensive turbine time building as well as pure fun, (buzz over to the neighbors for coffee, instead of climbing the fence) law enforcement patrol, (probably be a good idea if you were a cop before you try that one) pipeline and power line surveillance, agricultural spraying in confined areas and a host of other applications this model is sure to be filling the skies overhead very soon. In the USA the Mosquito XET falls under the experimental category and is built as a kit. RotorF/X also provides a turbine model that’s ready to fly for just over $50,000 including the engine and can be shipped worldwide. For more detailed information, specifications, performance and pricing on all five Mosquito helicopter models plus over 40 in flight videos visit their web site at http://www.rotorfx.com or contact them with questions at info@rotorfx.com If you love videos, this is the website for you, I especially loved the one by discovery channel. or you can call them at (818) 574-7663 and I can attest to the high level of customer service here, these guys are first class all the way.